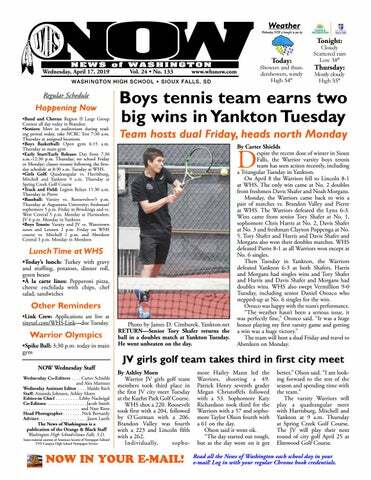 By Carter Shields espite the recent dose of winter in Sioux Falls, the Warrior varsity boys tennis team has seen action recently, including a Triangular Tuesday in Yankton. On April 8 the Warriors fell to Lincoln 8-1 at WHS. The only win came at No. 2 doubles from freshmen Davis Shafer and Noah Morgans. Monday, the Warriors came back to win a pair of matches vs. Brandon Valley and Pierre at WHS. The Warriors defeated the Lynx 6-3. Wins came from senior Tory Shafer at No. 1, sophomore Chris Harris at No. 2, Davis Shafer at No. 3 and freshman Clayton Poppenga at No. 5. Tory Shafer and Harris and Davis Shafer and Morgans also won their doubles matches. WHS defeated Pierre 8-1 as all Warriors won except at No. 6 singles. Then Tuesday in Yankton, the Warriors defeated Yankton 6-3 as both Shafers, Harris and Morgans had singles wins and Tory Shafer and Harris and Davis Shafer and Morgans had doubles wins. WHS also swept Vermillion 9-0 Tuesday, including senior Daniel Orozco who stepped-up at No. 6 singles for the win. Orozco was happy with the team’s performance. “The weather hasn’t been a serious issue, it was perfectly fine,” Orozco said. “It was a huge honor playing my first varsity game and getting a win was a huge victory.” The team will host a dual Friday and travel to Aberdeen on Monday. 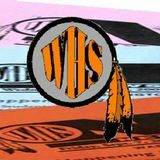 •Link Crew: Applications are live at tinyurl.com/WHS-Link—due Tuesday. Photo by James D. Cimburek, Yankton.net RETURN—Senior Tory Shafer returns the ball in a doubles match at Yankton Tuesday. He went unbeaten on the day. better,” Olson said. “I am looking forward to the rest of the season and spending time with the team.” The varsity Warriors will play a quadrangular meet with Harrisburg, Mitchell and Yankton at 9 a.m. Thursday at Spring Creek Golf Course. The JV will play their next round of city golf April 25 at Elmwood Golf Course. Read all the News of Washington each school day in your e-mail! Log in with your regular Chrome book credentials. School begins at 7:30 a.m. Thursday as seniors take test WHS will have a special early start/early release day on Thursday as classes begin at 7:30 a.m. and school dismisses at 12:30 p.m. to allow for an afternoon of teacher in-service and start off the spring break. Seniors will meet during reading period today in the auditorium to find out where they will report for National Career Readiness Certificate (NCRC) testing at 7:30 a.m. Thursday. No Warriors Read Together will be held today because of the senior meeting. The NCRC measures and certifies the essential work skills needed for success in jobs across industries and occupations and will allow students to show prospective employers concrete proof of the skills they have learned in high school. Seniors will be allowed to leave school when their testing is done on Thursday. No school will be held on Friday or Monday. Classes will resume following the first-day of the week schedule at 8:30 a.m. Tuesday. Wednesday, April 17, 2019 Thursday’s Schedule: School will begin at 7:30 a.m. Thursday and dismiss at 12:30 p.m. to kick-off the spring break. Jerry’s Day raises over $6,000 for Feeding S.D. Tuesday the Nachtigal family and many members of the WHS and Sioux Falls communities and beyond honored the memory of Jerry Nachtigal, father of senior Libby Nachtigal, with various acts of kindness. Jerry was a dedicated father and local business executive committed to helping others. Inspired in part by Quinncidence Day, Jerry’s secHear me. . . ond son Jack Nachtigal, class of 2015, organized Jerry’s Day By Maddie Risch of Kindness to be held every April 16 in an attempt to celebrate the life of his father. Jack thought a day dedicated to good deeds would be the perfect display of his father’s generosity and good nature. For this Jerry’s Day of Kindness, the Nachtigals wanted to do something extra special. They partnered with the local organization Feeding South Dakota to set up a fundraiser with an initial goal of raising $5,000. “I’m so proud of how the day went,” Jack Nachtigal said. “With the help of hundreds of people across the country, we raised over $6,000.” Feeding South Dakota also runs the Backpack Program, which supports Warriors of the future and others. With the funds, over 18,300 meals will be donated to those in need. “I’m so proud of my community, and I’m especially proud of my sister Libby, who reminds me to be kind every day,” Jack said. You can spread kindness on Jerry’s Day next April 16, or better yet, every day. Senior Maddie Risch experienced and spread some kindness yesterday. TURN LIFE UP A DEGREE. Congratulations Warriors! Washington Class of 2019 + 99% of USF grads report having a job in their desired field or being accepted into graduate school within 6 months of graduating. + Schedule your personal visit at usiouxfalls.edu/visit. Maryland may outlaw food foam By Luke Broadwater The Baltimore Sun (TNS) BALTIMORE — The Maryland General Assembly gave final approval recently to a bill that would make Maryland the first state in the country to ban polystyrene foam food containers and cups. The Maryland House of Delegates voted 100-37 to approve the legislation sponsored by Del. Brooke Lierman, a Baltimore Democrat. It was Lierman’s third attempt to pass the bill. “After three years of hard work, I’m thrilled to see Maryland be a leader in the fight to end our reliance on singleuse plastics that are polluting our state, country, and world by passing a bill to prohibit foam food containers,” Lierman said. “The health of the Chesapeake Bay, our waterways, our neighborhoods, and our children’s futures depends on our willingness to do the hard work of cleaning the mess that we inherited and created.” The legislation had already passed the state Senate by a 31-13 vote. The Senate bill was sponsored by Sen. Cheryl Kagan, a Montgomery County Democrat. The legislation contains some exceptions. For example, foam products packaged outside Maryland — such as cups containing ramen noodles — could still be sold. Also exempted are foam products used to package raw or butchered meat and foam products not used for food service. The ban would take effect July 1, 2020.